We are offering Exclusive Jute Beach Bags. We can custom design in terms of color and handle. 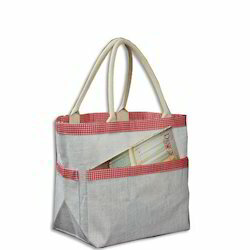 Beach Bags are used by the beach regulars, who love to enjoy the frothy waters of the sea, but still look chic. Beach bags are designed to look very elegant and snazzy to create that hip look. Manufacturers and exporters have been constantly coming up with innovative designs to meet the demands of the buyers worldwide. This is a Trendy and Fanshionable bag. In Different Countries there is a huge demand. It add a classic look to the beautiful ladies. Any picture can be printed on the whole bag fabric. You can also print your own pictures. With our clear intention to meet the client’s requirements, we are engaged in offering Jute Beach Bag. Our customers can avail these bags in different colors. The range are offered by us in multi-colored prints. We can customize these pouches to suit the exact requirements of the customers. SIZE A :14" X 17" X 7"
We are high quality manufacturer of wide range of Jute Beach Bags. Quality being the sole aim, we offer an extensive array of Jute Beach Bag that ensures smooth texture and are delivered with vibrant shades. Our entire product line is eco-friendly in nature and ensures beautiful patterns. 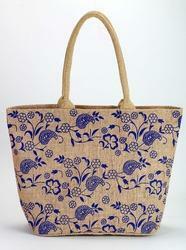 Jute Beach Bag is eco-friendly in nature and comes in budgetary limits. We deal in a unique collection of beach bags which includes a wide range of cotton beach bags, jute beach bags, printed beach bags, embroidered beach bags etc which give a very elegant and graceful look. We provide you with a wide range of bags available in different, shapes and fabrics.